News | ALOHA TABLE Waikiki - Aloha Table's main store is located on the east side of DFS Galleria along Kalakaua Avenue, the main street of Waikiki. "Aloha Table Waikiki" was chosen as 1st Place! 111-HAWAII AWARD from Hawaiian gourmet, souvenirs, tours, 50 categories, By online voting by all Hawaii fans, each ranking is decided It is the Hawaii State Tourism Board official recognition program. 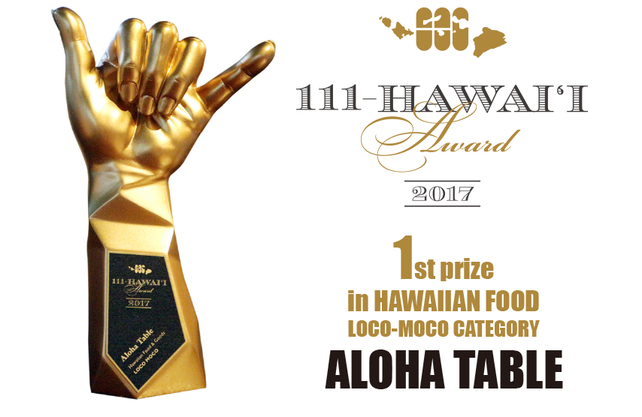 Since opening as Aloha table head office in Waikiki, Our loco-moco, loved by many customers, we have won a top prize in Hawaii Food / Locomoco category this time. This is also a gift for your patronage, thank you very much. To the patty using the carefully selected Kobe beef, demi-glace sauce of mushroom and onion and rich flavor. It is premium · locomoco which is excellent compatibility of high-grade meat juice of Kobe beef and rich, fragrant demi-glace sauce which sweetness of vegetables blended.